When 23-gauge is too small and 18-gauge is too big, Senco says their 21-gauge nailer is "just right". But unlike most pin nailers, the new Senco FinishPro 21LXP uses nails that have a slight/medium head. Senco says it delivers the holding power of a brad nail with a much smaller hole. 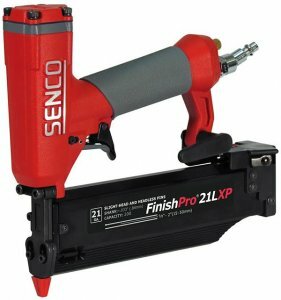 Offering a fastener range of 5/8-inch up to 2-inch, the FinishPro 21LXP can handle everything from miter joint pinning to full on trim installation. It uses a metal magazine that auto adjusts to accommodate the different faster lengths. The tool is lightweight at only 2.7 lbs, and as you would expect, it is also small at less than 9" in height and 8" in length. It looks much like a big brother to a 23-gauge nailer should look, but this one has an angled grip for better ergonomics. I don't know if I want to carry around another nailer, but I can see where Senco's 21-gauge nailer could come in handy. We often try to use the 23-gauge nailer for things that we probably shouldn't be using it on simply because it leaves a smaller hole. If a 21-gauge hole is not much more noticeable, it might be a better solution. Instead of needing a 23g, 18g, and 15g on a trim job, maybe I could get by with only a 21g and a 16g.